My specialty is edge-to-edge pressure flaking. I have been doing edge-to-edge work since 1991. It is a labor intensive process, but it has its rewards. Edge-to-edge pressure flaking is a difficult technique that is rarely used by today's modern flintknappers. 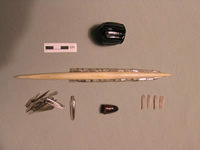 Blade technology was wide spread in many places throughout the world and has a long lived history. 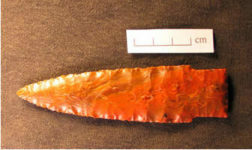 Click the learn more link to learn all about Projectile Heat Treated Points and Replica Paleo Points. Welcome to my web site! 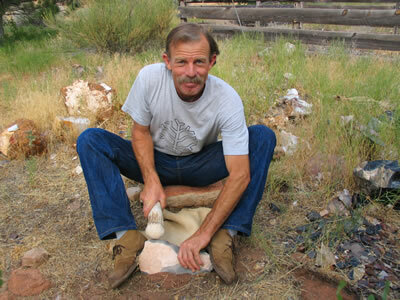 I have been flintknapping since 1986. I guess one can say I’ve “caught the bug.” I grew up on a ranch in Southeastern Utah, which is rich in antiquities. Extensive exploration of the area fired my curiosity and gave me the inspiration to undertake flintknapping. I must admit I’ve had some great teachers with good information along the way; Dr. Bruce Bradley, Dr. Errett Callahan, Bob Patten, Gene Titmus, and of course the ancient masters who created the wonderful stone artifacts we admire today. I have worked locally for two contract archaeological firms, where I preformed survey, excavation and lithic analysis. Work experience, coupled with self study has resulted in an extensive knowledge of stone tools. Read about my recent research trip to Denmark. Over the years I have flintknapped a wide variety of beautiful stones and I appreciate them for what they are, although I am partial to the high quality variety of brown, gray, and tan flints. These earth tone rocks reveal the craftsmanship far better than flashy multicolored stones. 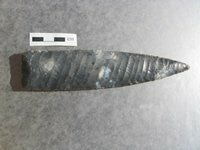 When I look at a flint work I like to see the detail.